If you’re an angler there is a high probability that you have some kind of superstition or superstitious act that you do to make sure you catch that river donkey you know is in there. One of the most common is sunscreen, if you been fishing you most likely used sunscreen at some point. Certain anglers have a theory that the fish can smell or sense the sunscreen on the fly and won’t take that fly as a result, no fish. The Bonefish & Tarpon Trust decided that this deserved a study. Bonefish feeding behavior was unaffected by the addition of conventional and zinc sunscreens to the bait (fly). Bonefish were neither attracted by nor dissuaded to consume contaminated bait. 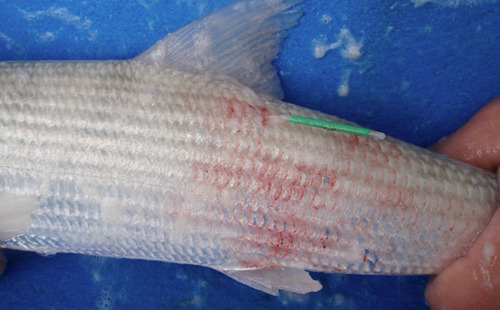 Considering that bonefish rely primarily on their eyesight to identify prey, these results may not be surprising. Anglers should be more concerned with their choice of fly than what they last touched when it comes to hooking fish. Prior to handling, researchers coated their hands with either conventional oxybenzone-containing sunscreen, zinc-based sunscreen, donned UV-blocking gloves, or had clean wet hands. Mucous removed by the researcher’s hands was weighed and recorded. Even thought this study was done for bonefish there is most likely a direct correlation to any fish that is handled improperly. All fish have slime as a first means of defense and should be handled with care. Remember to wash and wet your hands before removing hooks and try to keep them wet!